The recovery process and results in the months following an initial hair transplant surgery will vary among patients depending on the surgical technique performed, the patient’s anatomical makeup, and many other factors. With that in mind, there are general aspects about the weeks and months after surgery that are experienced by most patients here at Arocha Hair Restoration. Following hair transplant surgery, the areas where hair follicles were harvested and the regions where they were relocated will likely be somewhat tender, swollen, and bruised. This is normal and should dissipate over the next several days. Discomfort is typically minimal after surgery; however, any pain can usually be alleviated with over-the-counter medication. If your transplant surgery involved skin grafts, any scabbing on the dermal surface typically sheds about one week after the procedure. Many patients are able to resume work or other daily activities about two to five days following treatment. Once the initial healing and hair restoration recovery process is complete, the results of the surgery start to become apparent. Remember, it is completely normal for the transplanted hairs to fall out in the first three to four weeks. Over the next few months, the transplanted hair should be growing again – this time for good. Many patients experience a growth rate of about ¼ to ½ inch a month. Again, this varies among each patient; but most individuals should see at least a 60% rate of growth in the treated area after about six to nine months. Some patients may still be experiencing new growth 12 months after the surgery. In some cases, Dr. Bernardino Arocha may also recommend the addition of medical treatment or ROGAINE® in order to maximize the results. 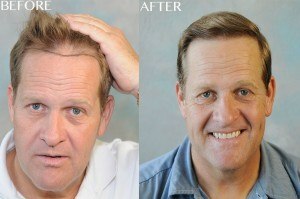 View hair restoration before-and-after photos here. Once you come in for your hair restoration consultation, Dr. Arocha will be able to thoroughly examine you and talk with you about all aspects of the process. If you decide to have surgery, he will create a customized treatment plan designed for your specific needs and explain the recovery process in further detail. For more information, or to schedule a consultation, please don’t hesitate to contact Arocha Hair Restoration today.